Given Facebook's dominance in the social media space it's imperative to have a social SEO strategy that leverages your Facebook page. 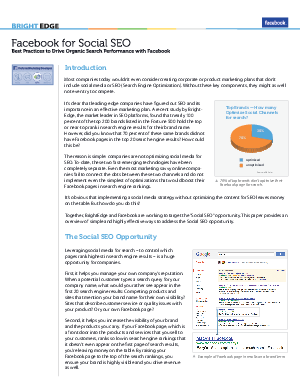 Yet 70 percent of the Fortune 500 do not have Facebook pages in the top 20 search engine results. Find out why this is and the opportunity that awaits in this report from BrightEdge. This year, 86% of Search Marketers will focus on Facebook marketing.